None. Annual coreopsis cannot tolerate cold temperatures. Mix a light application of a balanced organic fertiliser into the soil prior to planting. 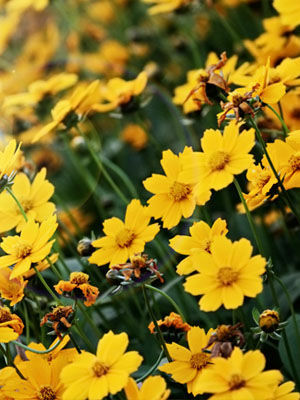 Annual coreopsis needs less fertiliser and water compared to other flowers. The narrow, airy plants rise up suddenly in late summer, making them great replacements for early season bloomers. Annual coreopsis is an excellent flower to grow in wildflower meadows. Sow seeds in moist seed starting mix indoors, or wait until after the last frost has passed and plant seeds where you want the plants to grow. The bicoloured blooms of coreopsis attract butterflies and beneficial insects. Snip off spent blossoms to keep plants looking neat, and to prolong flowering. Tall plants benefit from staking. Plants will reseed themselves with a little encouragement.